The Intrepid Traveler and I love Museums – in fact that’s a big part of the reason we became Visitors instead of Tourists – guided tours never give you enough time in the Museums. We can easily spend 3 to 4 hours in a museum – we get the audio tour, we read every sign, we examine every display carefully. I mean – we love museums. Now I know that not everyone likes museums the way we do, people don’t even like Aquariums the way we do. So instead of a blog on every museum we visited (it would take way too many days) – I’ve decided to rank them – from worst to best – and defend why. 8. Our least favorite Museum – The Sokcho Beach Nature Museum (Walking distance from the Express Bus Station). Size matters – and this one was a single large room on the 3rd floor of a building full of restaurants. The stellar attraction was a model of a dinosaur that was sensitive to movement. When you got close – the jaws moved. Marcel (age 5) loved it. The rest of the museum was a taxidermist dream come true. There was a mock-up of an aquarium – poorly preserved fish with a paper ‘sea’ background, no explanation in English, I’m not even sure there was an explanation in Korean. Most of the ‘fish’ were plaster models – I think. The next big section was a series of land animals – lions, tigers, wolves, coyotes, polar bears (? ), and the like – again – either poorly done plaster models or really badly done taxidermy. The highlight, besides the view and the moving dinosaur, were a series of animal skeletons and 3 large models of sailing ships. I didn’t get the shell collection at all. For free – it was a fun way to entertain a 5-year-old, if I’d had to pay – it would have been a complete waste. Lots less fun than building sand castles – trust me. 7. 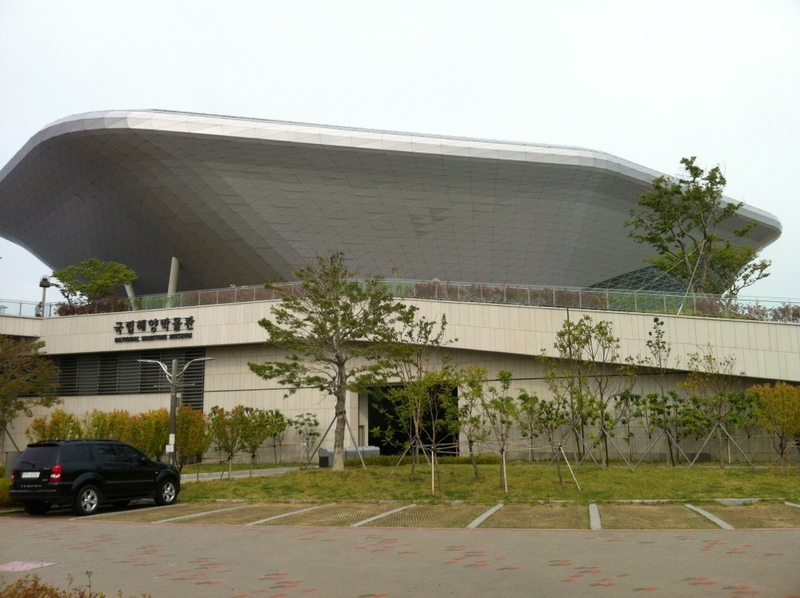 Busan – Museum of Art (Modern/Contemporary) – Free. (Has its own subway stop) Modern art is always a challenge to the viewer – and while I always enter museums like this with a feeling of excitement, I often walk out wondering what the world is coming to. The current exhibit contained some really interesting pieces, and some really strange stuff. 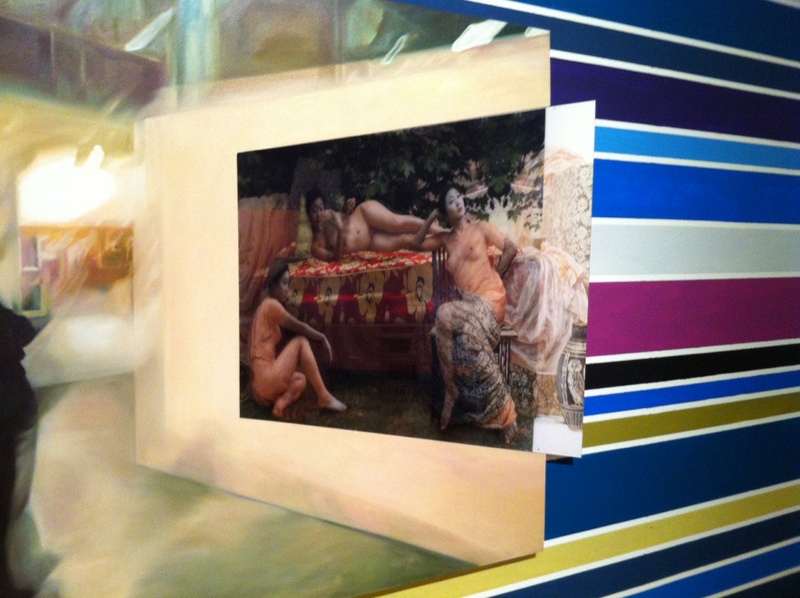 Highlight – art that ‘stripped’ the clothes off the people in the paintings when you stood in the right place. Bottom line – the price is right, and if you never go – you’ll never find out how artists are seeing the world we live in. 6. Busan – Museum – Free. (Ask for directions – its right next to the UN Cemetery – and not hard to reach.). Best parts of this museum were the life-sized re-creations – including a street from 1900 (when they first had barber shops in Korea – before that men wore their hair long and never cut it), the amazing video footage of the aftermath of the war, and some of the displays from earlier periods. Free Audio tour is a must of course. I liked the use of walk over displays too. In one, the first street car in Busan drives down the road. This museum is a must on the school tour circuit – and I got trapped between an exhibit and a stream of about 300 3rd and 4th graders walking through the museum. Trust me – I’m not sure they stopped anywhere – they just walked straight from the entrance to the exit. Tour Done. But then there was this foreign lady to see – I got hi, hello, hi from about 80% of the kids – so not only was this my personal highlight – I think I was theirs! 5. Seoul – National Korean Folk Museum – Free. (Close to the Gyeongbok Palace – walk around the outside of the Palace keeping the wall to your left – you won’t have to pay to enter) This was the very first museum we saw in Seoul, and what I remember most were two sections – a life-size traditional home, furnished as if the family had just gone out. You could see the kitchen area, and imagine the bustle as food was being prepared. The other part I thought was neat was the Children’s Museum – basically a space attached to the main museum but kept for just parents and young children. There were holes to stick your hand in, there was a large egg that you sawed in half to reveal a treasure (I’m guessing this is a Korean Fairy Tale). The kids got extremely excited to have the opportunity to do the sawing. We plan to go back with Marcel (age 5) to check this out. 4. 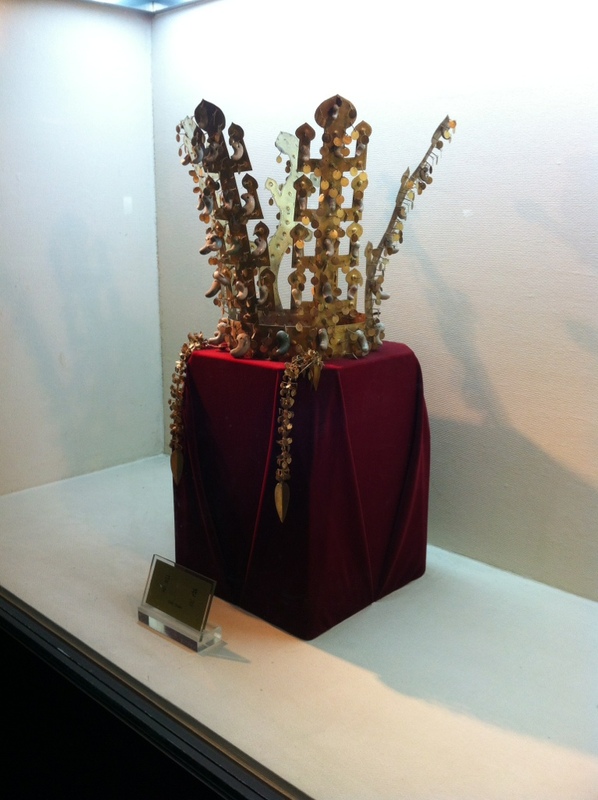 Gyeongiu – National Museum – Free – (Ask for directions) (in 3 parts – Shilla History, Stuff found at the Anapji Pond Historic site, and Buddhist Collection). We opted for the Audio Tour (1000 Won = $1) and it was well worth it. Even though they had moved the collection into a smaller building while they ‘earth-quake proofed’ the larger museum, seeing how seriously old the culture in Korea is was stunning. On one wall is a timeline of what was happening in Korea vs what was happening in the world – puts things into perspective fast. I also particularly loved the Buddhist collection – which since we saw this following our temple stay at Haein-sa – made a lot more sense. This is also the place we met the ‘English’ Teacher/Tour guide who confused rice and lice. But the collection of Silla remains is worth seeing. Over 1000 years old and still so beautiful. 3. Busam – Maritime Museum – Free (Getting there – take the 66 bus from the Nampo-dogg subway stop). The building is worth the visit – a gigantic stainless steel Ship sailing off into the future. The exhibits were excellent as well – including a full-sized mock-up of one of the ships that the Josen rulers sent to Japan to try to keep peace – in the 1600’s. 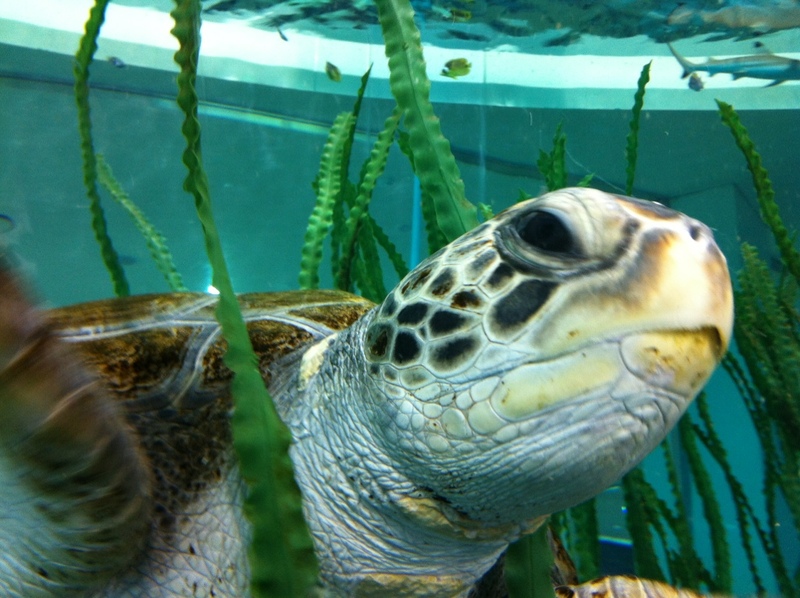 There’s a huge walk thru sea tanks – this one had a very friendly turtle. The video footage of the port of Busan in operation is definitely worth seeing as well. 2. Seoul – Women’s Rights Museum – Charge. (Getting there – it’s walking distance – sort of – from the Hongik University subway stop) This is a small, but extremely interesting museum devoted to the ‘comfort’ women (starting at age 11!) effectively imprisoned by the Japanese to ‘service’ their soldiers during the occupation from 1905 to 1945. What is most interesting is the amount of ‘evidence’ they have collected about what was happening, including numerous stories by ‘comfort’ women who have openly and painfully revealed their past. The history is shameful, but the effort put into this tiny museum is worth seeing. Highly recommended. Picture below shows the ‘memory’ or ‘butterfly’ wall outside the museum – visitors were encouraged to sign a ‘butterfly’ dedicated to the memory of one of the ‘comfort’ women and pin it to the wall. Lovely thought, eh? 1. Busam – Fisheries Museum – Free (Getting there – walk 2 minutes from the Haedong Yonggung Temple – makes it definitely worth visiting the Temple. They are connected by a red bridge and a seaside path. 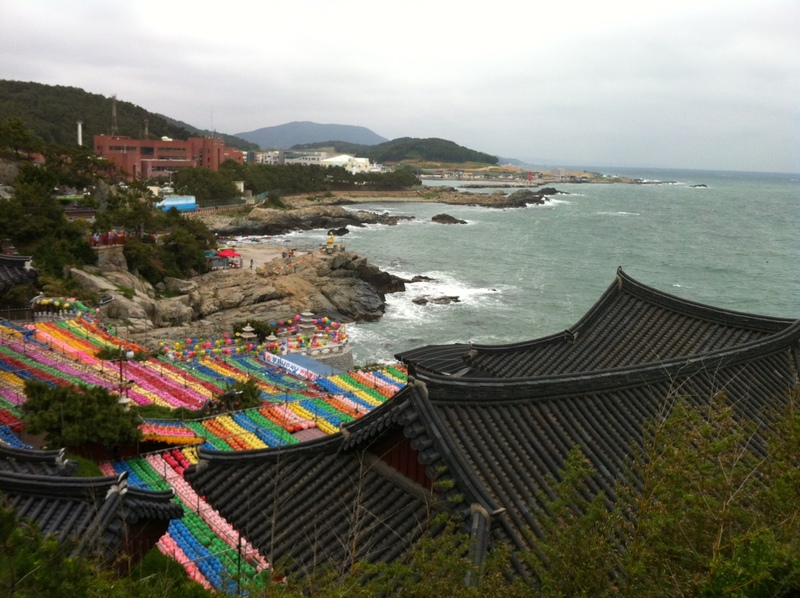 To get to the Temple – take the 181 bus from Haeundae Beach Station.). I liked this Museum for several reasons – there were lots of fish in tanks to look at – they made the path ‘up’ to the main area look like you were swimming thru an underwater cave, and the exhibits were very good at explaining the different types of fishing nets – without a word of English. There was even an entire section devoted to how pearls are made in oysters, another about women breathe-hold divers, and another one on harvesting abalone. Plus there were 2 interactive sections that were quite unique – one showed you the nutritional values of different foods on thermometers – the other allowed you to spin a dial and point and ‘shoot’ a fishing area off the coast of Korea. Your reward for hitting the target – a picture and description of the type of fish you’d find there. Fun museum – great location – and you can easily walk from there to one of the top temples of Busan – the Haedong Yonggung Temple. Plus – if you like fish – there were several quite reasonable restaurants nearby. A win, win, win! The picture above is taken from the highest point in the temple – looking towards the fisheries Museum – that blue wall you can see in the middle distance. All the lanterns are strung to celebrate Buddha’s birthday – which was the day after our visit. Lovely, eh? Very peaceful scene, wonderful temple, great museum. ← Amazing Mushrooms – and Great Looking Plastic Food!